The GS500R Overlander project bike is taking shape, although it’s not quite a fully set jelly. The critical mod: adapting the rear DR650 hub and brake to fit the donor bike’s swing arm and chain run has been completed pretty seamlessly by Matt and his team of farmyard engineers (see pic below). 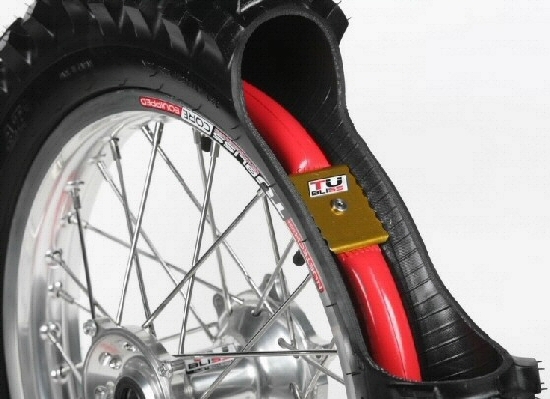 I know what you’re thinking: why does the front tyre look fatter than the back – is it the camera angle? No, it’s just that at the time I didn’t want to waste money on new 19-inch tyres in case the GS turned into what the French would call, un piège de mort. So I bought used cheapies just to get the thing rolling, first for the front, and a while later another for the back which was not identical. Just as well really, as following my recent Morocco trip I’ve discovered that Heidenau K60s are the ‘bomb’, as the bloke on the right would say. It took a bit of firing up off Matt’s V8 Landrover offroader to get the GS running while whipping out a plug to dry and blowtorch. Even then the GS didn’t seem to run well. Was there a badger nest in the air filter? I could barely pull up the track to the road, and while slipping the clutch mistakenly thought it was because the gearing was way off. As with most things on this build, we took an educated guess here, but at 42/16 the gearing’s actually turned out to be in or around the ball park. Running down to the village to top up on fuel I thought, jeez, this 500 really is a lot slower than the BMW FGS650 twin I’ve been riding lately. Of course that bike has got at least twice the horsepower and 20 years of development on the G. Heading back, the weight of that extra tenner of unleaded in the tank saw the bike struggle to escape the dale. 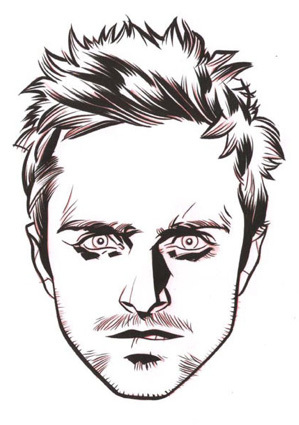 Something was not right. I pulled over and pulled off the left plug cap – no difference. A ha! as the bloke on the right would say. A little bit of fiddling with the plug cap got past more cobwebs, the second barrel fired up like a Saturn V and suddenly the GS500 was running like… a GS500. I tore of up the lane like a teenager on his first moped, awestruck at the feeling of raw power. 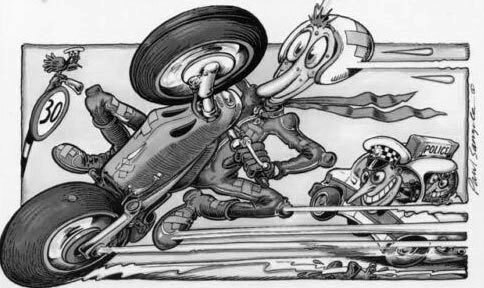 Like Ogri’s beaky-nosed mate Malcolm (left) I was heading for a prang, so it was time to consider braking. The DR650 front end’s disc had been binding a bit as the pads off one scrapped DR got to know the disc rotor from another. A quick check at the fill up proved that the rotor wasn’t getting hot and causing the lame performance. In fact, yanking the lever did see the forks dip hard in response so it can get there if it has to. I guess it’s just not the quality of braking I’d got used to while running the 2012 BMW. 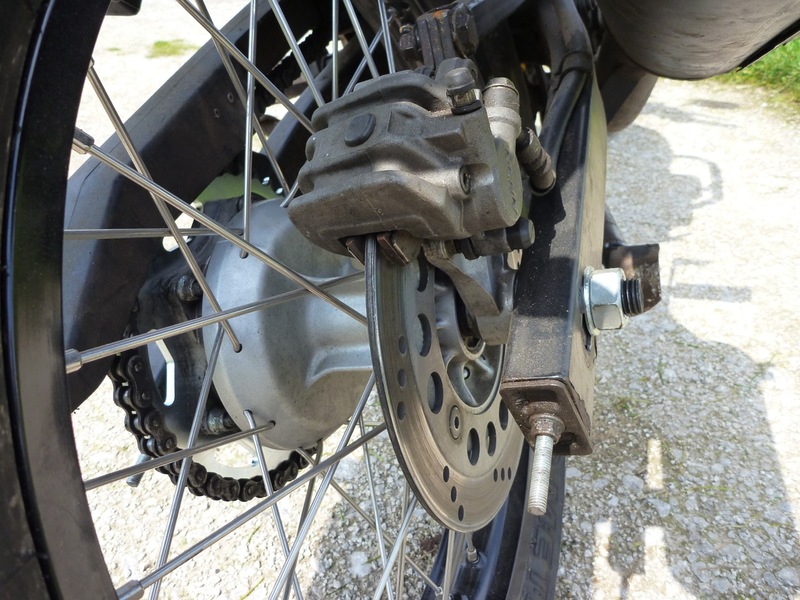 The back brake was considerably slacker, partly we suspect because the DR650 calliper which had to be used to clear the Talon spokes, may not compliment the bore of the GS’s master cylinder. So the back brake is mushy and with a long throw. Maybe a bleed or a braided hose will bring it round, or a master cylinder off a DR.
Another problem. The main stand had to be extended by several inches (right) and it now takes an extreme heave to get the bike up; not something I could see myself being able to do with baggage at the and of a tough day on the road. The feet are now clearly too far back from the pivot point for the factory-set leverage. And yet it’s as long as it needs to be, lifting the back a couple of inches off the deck, like a normal stand. Curved stand feet could get round this. But in fact when I think about it, the GS is a bit too high; I can’t get my feet flat on the ground. With the new suspension and the 19s it’s probably jumped up at least four inches judging by at the extended stand. I really appreciated the BMs low height on the dirt in Morocco and am not looking for masses of clearance on the GS-R. In fact this will be easy to modify: slide the forks up the clamps and back the shock off max preload where it is set now (left). 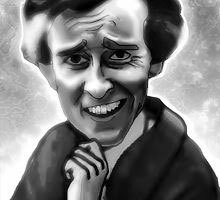 Didn’t get a chance to do all that, as it was a flying visit to the Mattlabs. Steering feels a bit slow too, but I think the height may have something to do with that. As it is I don’t think the steering of a regular GS500 would get a job in a bread slicing factory. Getting used to the bike and modulating suspension levels may fix all that, and anyway there are new tyres to come. The dirt bars too felt a bit narrow for my liking, or no wider than stock and maybe could do with a lift. Again, easily done. It’s hard to tell if a thinner back tyre greatly affected the steering or ride, not having ridden a bike with back-to-front tyres before. My plan is to run identical-sized tyres front and back. One thing’s for sure, the seat feels great, although as mentioned earlier, the rear-set pegs could stitch the knees up on a long day – and that could be crippling. 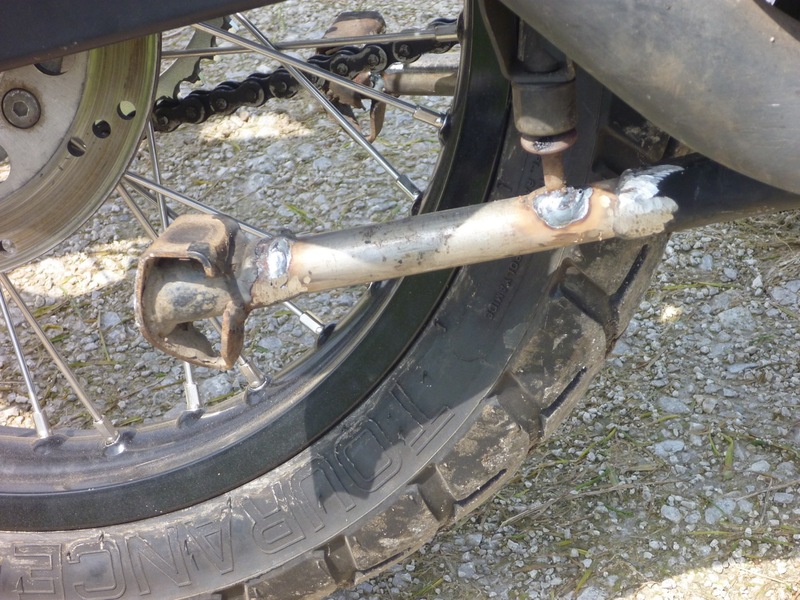 So maybe some sort of highway peg off the crash bars will work. One good thing, even though it’s tall right now the GS feels pretty light for what it is and a good 20 kilos lighter than the BMW GS650 which was at least 200kg. Might try and weigh it one time. Once the above mods are seen to Matt the Mig or Andy the Arc are going to fabricate a rack, but not just another off-the-shelf, too-far-back, 18-mil loop jobbie like I used on Morocco on the BMW. Something as securely mounted, but with a hinged or somehow retractable platform plus a ‘sheep rack’ platform on the back – always handy. That way the pans can sit rather than hang – a much better arrangement for an overland load, IMHO. I was going to fab’ some PVC pannier liners with a heat gun and roller, and a mate had offered to sew me up some Cordura outers. I would have kept the Monsoons I used in Morocco if only they had been my ‘Fibonnacci shape’: less wide, more long and bigger, but since writing this Adventure Spec have started selling a ‘Magadan bag‘ with input from Walter Colebatch and based on the Steel Pony Gascoyne he’s used in Russia and a bag whose dimensions I’ve admired myself, if not the canvas fabric. If all the hard work’s been I’m be happy to order me a pair. One thing I was also thinking of is junking the fat OE pipe and fitting something like this (right). A cheap ‘one-size-fits-all’ mega can be bought of ebay for 30 quid but I’m not 17 anymore and couldn’t bear a loud pipe or unravelling all the jetting and valve-burning issues. 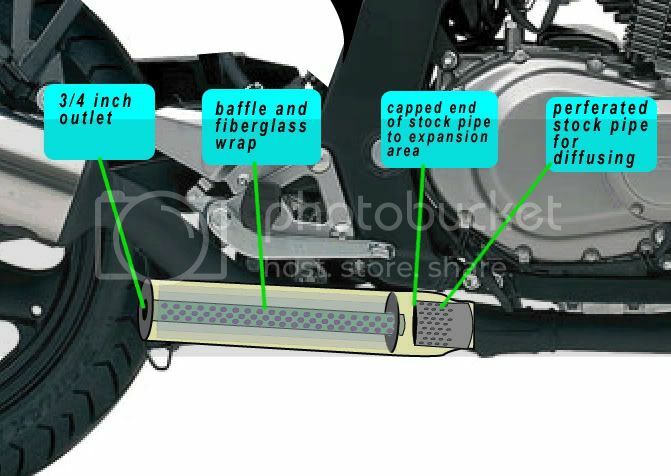 It seems the GS muffler only weighs some 5 kilos anyway so if pannier space is so important why not just chop the regular pipe at the neck and drop the angle as in the gif below. It’ll be good to have the bags in close and the pipe underneath, and its an easy job, giving what, at least four inches more bag space. After my over-width Morocco experience and seeing how slim the GS is, it would be nice to keep it that way. Anyway, I’m off to the Overland Expo in Arizona in a couple of weeks, a great chance to pick up some goodies in the US, including a pair of Tubliss liners (left) which enable you to run tyres tubelessly on spoked rims. As you may know, I tried doing that before without complete success. 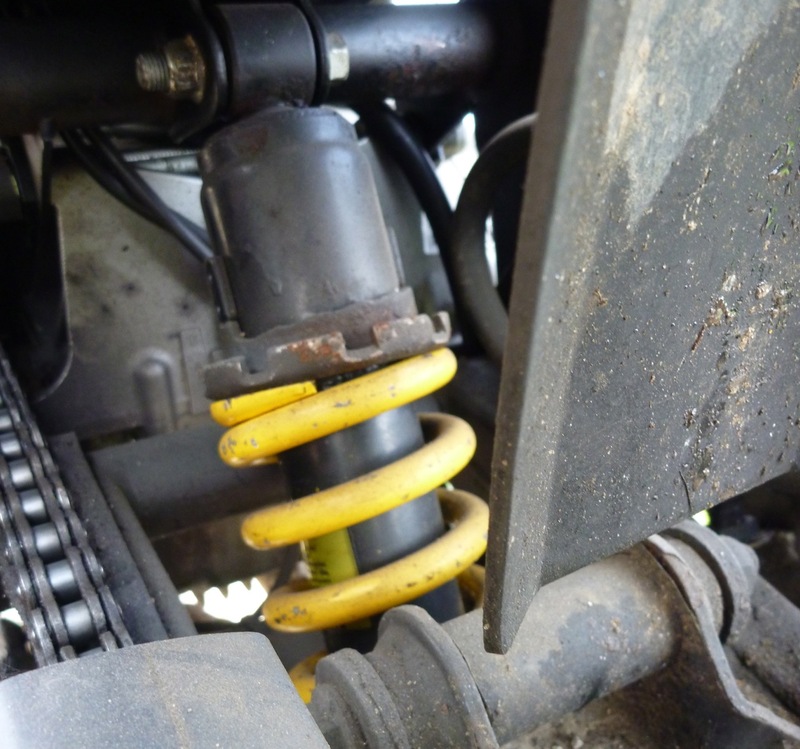 I know Tubliss are said to be for off-road use only, but I’ve interpreted this to be an issue of legal liability on the pubic highway rather than anything to do function or real-world safety. 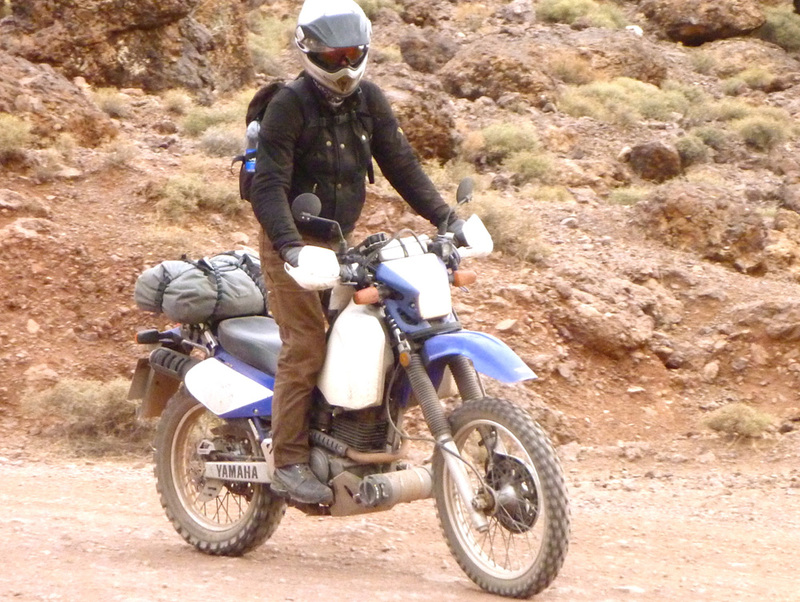 Robin, with whom I rode in Morocco last month has run Tubliss on his TT250R all over the world for years (that’s him right with all his kit – including full camping gear). 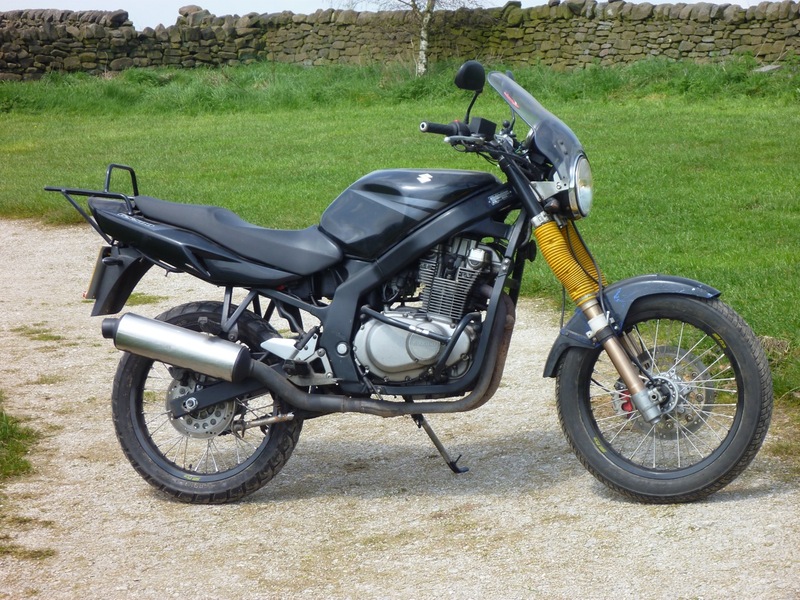 A meekly powered GS500 with a modest payload isn’t going to tie the tyres in knots. I plan to fit the front 110/80B (59 T) K60 Scout (my review) I used on the BM in Morocco (left) and another new one for the back. The 100/90 57 H is a tempting 30% cheaper and still with a load index 230 kilos and a 130mph rating, neither of which the GS will see in its lifetime, but I’d need two so I’ll stick with the wider 110/80 at another 100 quid. 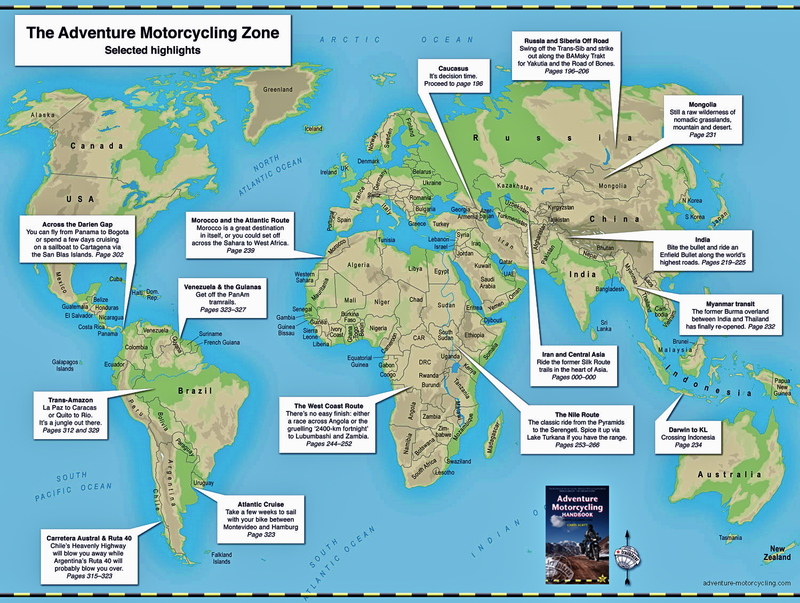 This entry was posted in AMH News, Project Bikes, Suzuki GS500R Overlander and tagged adventure spec magadan bag, building your own rack, Enduristan Monsoon panniers, GS500 low pipe, magian bags, making your own panniers, morocco overland, piège de mort, sheep rack, Suzuki GS500, Suzuki GS500 dual sport conversion, Suzuki GS500 suspension mods, Suzuki GS500R overlander, tubliss for road use. Bookmark the permalink.